Are you familiar with project-based learning? How about the idea of a side project? Today we’re going to explore how you can take a project-based approach to the development of your sketchnoting skills, in a way that also supports the growth of your creative career. That’s what a creative side quest is all about, as explained by Andy Miller in his podcast Creative Pep Talk. 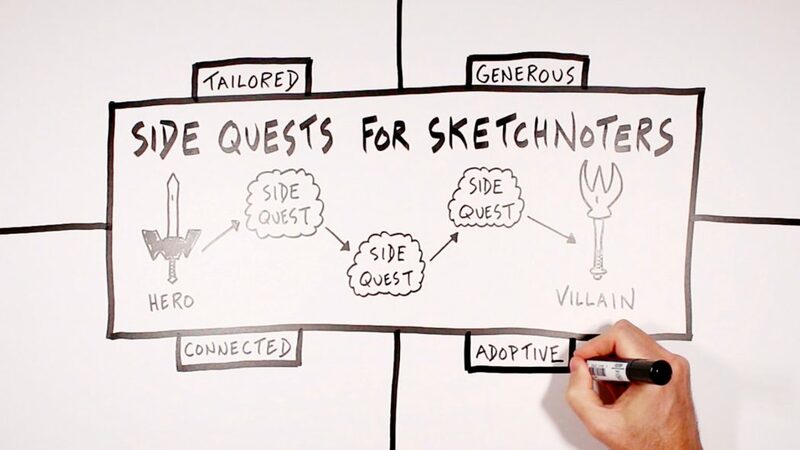 I enjoyed his side quest series so much that I decided to explore what it might look like to develop a sketchnoting side quest for those who are developing their visual note-taking skills alongside a creative career. 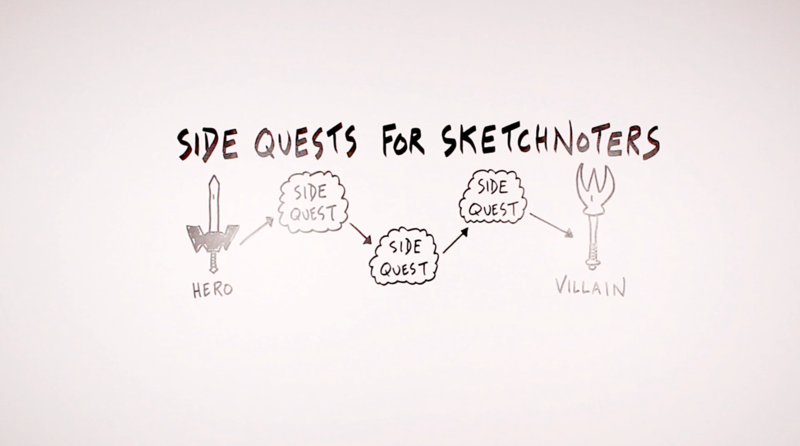 So here’s a breakdown of what side quests are all about, and how you as a sketchnoter might take one on. First, let’s look at what distinguishes a side project from a side quest. According to Miller, the difference is that in addition to helping you build your skills, side quests also contain layers of business and marketing strategy that will help you to move your creative career forward. 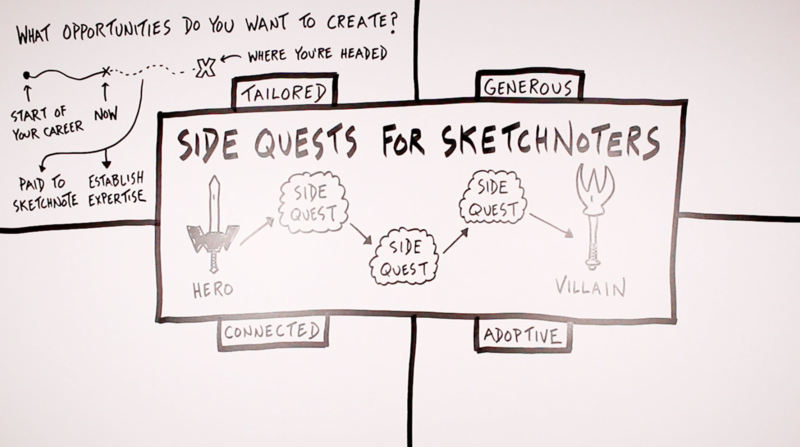 Side Quests: Build your skills as the hero before you go up against the villain. In that way, side quests are designed for folks that are in the process of building a career that depends on creative skills. This project-based approach is an opportunity to build your creative skills while also making strides in your career. 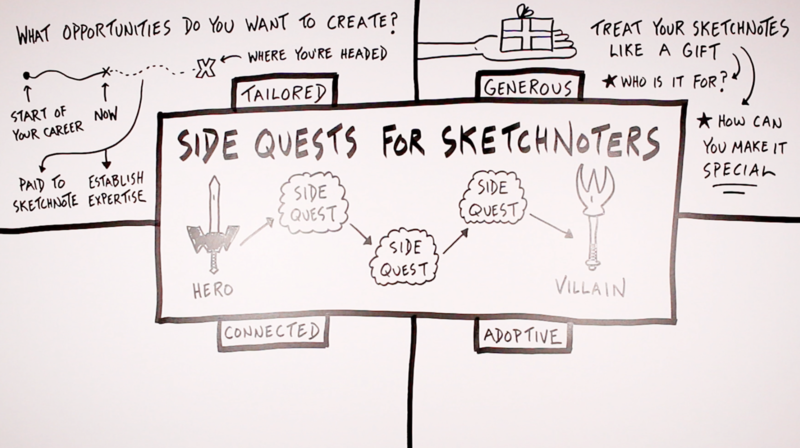 Let’s look at each layer of strategy individually, and how it might apply to a sketchnoting side quest. The first layer of a side quest is that it’s tailored to the opportunities you want to create for yourself. As Miller put it: create a side project in which you do the work that you want to get paid to do in the future. Make your side project tailored by having an end goal in mind. For sketchnoters, I see two primary ways to tailor your side project. The first is for those who want to get paid to sketchnote – to start using their visual note-taking skills as a freelancer. In that case, develop a side project in which you’re sketchnoting the type of thing you’d like to be paid to sketchnote. Pick the media format and the industry that you’re most interested in. Maybe that’s podcasts about politics or books about education. If you use those as your source material then you’re more likely to get freelance requests within that same area. The second approach is for those who want to use their sketchnoting skills to establish their expertise in whatever career they’re pursuing. This second approach is powerful because sketchnoting at its core is a professional development tool that can be applied to any type of career, and this example shows how: you create a side project within your current career, and the sketchnoting piece is just one component that helps you establish your knowledge in the field and your ability to effectively communicate and solve problems. The second layer that takes a side project and makes it a side quest is generosity. Treat it like a gift that you give to someone else. Make your side project generous by treating it like a gift that you give to others. Who is that gift for? And how can you make it special? Even though sketchnoting is often an individual activity that only needs to be beneficial to you, in this case its purpose is to be helpful to others, which is why considering those questions above is useful. So have a specific recipient in mind, and create your sketchnotes with care, knowing that at the end of the process you’ll get to share that gift with others. The third layer of a side quest: that it’s connected to other people. Think about how you might involve others in the process of creating whatever it is that you create throughout your project. Make your side project connected by involving other people in the creative process. The easiest way for sketchnoters to do that is by simply sketchnoting the ideas of others. That’s what I’m doing here–I’m sharing the ideas from Andy Miller in a way that I hope is hopeful for you. Whose ideas might you sketchnote and help spread? The second (and more challenging) way you can make your side project connected is by collaborating with other sketchnoters in the process. The Sketchbook Project is a good example, because multiple people contribute to each individual notebook. Are you friends with other sketchnoters, either in your local area or online? Think about what you might make together! The fourth and final layer of a side quest is that it’s adoptive. The core idea here is that where you share your work is as important as what you share. Make your side project adoptive by intentionally choosing where and how you share it. Since the internet is such a crowded place and attention spans are short, you want to make sure that the distribution channel you choose for your project is well suited to it. For sketchnoters, anything that allows for a visual component could be a good fit. So explore those that you’re most familiar with and enjoy using, but also keep an eye out for emerging platforms–places where there’s a growing audience but not yet an over-saturation of voices. If you find a place like that it could be a good opportunity to make a name for yourself. So, has there been a specific project that’s been brewing in your mind while reading this post? If so, start taking some action on it! Add a bit of each strategic layer above, and get moving. I’ve got a side quest in mind for myself, but I’m going to wait until 2019 before I start sharing what that is all about (just know that I’m super excited for it!). 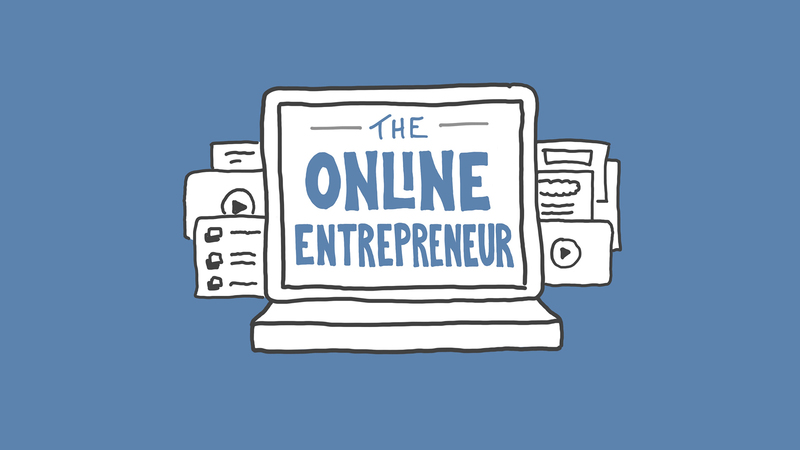 The courses within that bundle will help you build your sketchnoting skills while also building a better future for yourself. You can check out other individual courses and other bundles from the course library page. 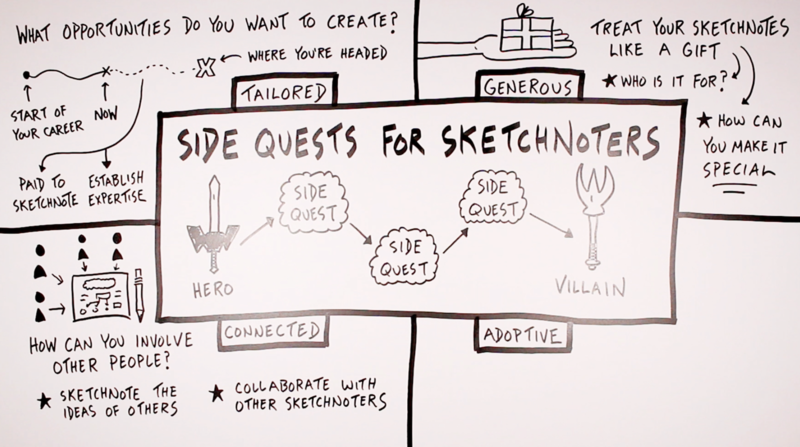 Good luck getting your own sketchnoting side quest up and running!